Humpback whales roam the open seas, with regular migrations from feeding grounds at high latitudes to calving grounds in lower latitudes. Named for the distinct hump behind the dorsal fin, this agile and acrobatic whale often leaps out of the water and slaps its tail and flippers on the water’s surface. 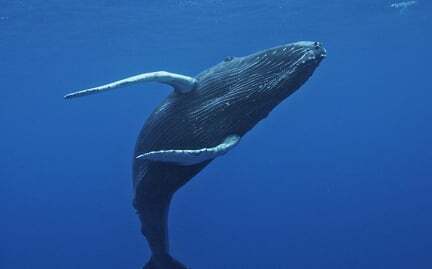 Along with ship collisions and the degradation of their habitat due to pollution, the greatest threat to whales is entanglement in fishing gear, also known as bycatch.